Nick Jones, Nickkkk Jonessss, If you haven’t seen this curly haired man gracing the pages of Alliancewake.com in the past you might want to look again. Nick is one of the guys who lets his riding speaks for itself. Nick has an impressive bag of tricks and his style is just as classy. Maybes its his college education or maybe his Lincoln but this guy is classy. I just had to beat around the bush with him. Patrick: Nick Jones! Do you hate it when people say your name like Nickk Jonessss (like Mike Jones)? Nick: Haha at first I thought it was cool, but then again at first I thought PT Cruiser were cool also. Patrick: How do you manage too get all these hot girlfriends? Is it your college education? Your wakeboarding moves? Nick: All these? Haha, my girlfriend is going to love this one! But I really have no idea, maybe it’s my hair, or maybe it’s because I always wait till the end of the night to talk to them. Facebook helps also! Patrick: What are you going to college for anyway? Nick: I’m going to UCF for a double major, Commercial real-estate and Finance. But I don’t ever plan on using it, I’m just going to wakeboard forever. 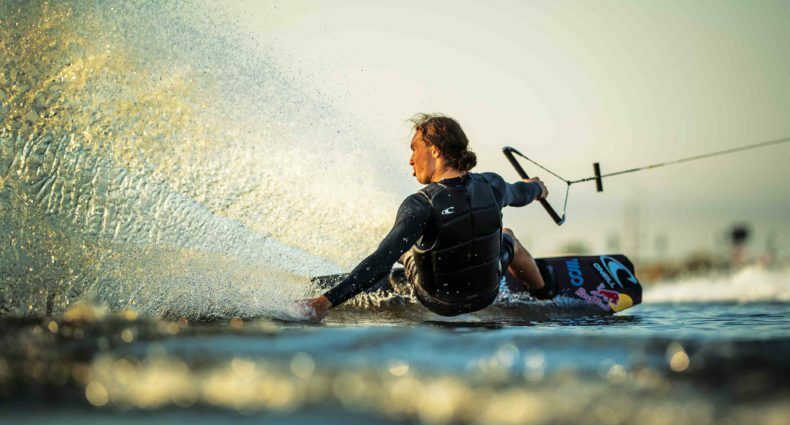 Patrick: Ever thought about being a Pro Wakeboarder? Are you gonna ride the Pro Tour this year? Nick: I knew I was a pro when World Pub sent out the “I’m Pro” shirts to everyone that registered for Pro Tour last year! Come to think of it, I think that shirt is how I get the ladies! And yeah, I plan on ride tour this year, doin my thing in the Semi’s and Quarters! Patrick: A lot people might know that your pretty good at wakeboarding. How many different 9s do you have? Nick: I don’t like to brag, but 3. And 6 different 7’s, but who’s really counting anyways. Patrick: Ever thought about trying some 1080s? Nick: Nope, never. Actually I’ve tried w2w toe 10’s for 3 full days, probably 60 attempts in all. It was right before Surf Expo. And the more I try, the more I respect those guys that’ve done them. Patrick: Who are you riding with these days now that you moved to winter park, home of the rich and famous? Nick: Yeah it’s definitely high class. I don’t feel uncomfortable in my CWB corporate polo anymore. Jeff McKee rides out on my lake, so I usually call him 2 or 3 times a day. Also I live with Scot Stewart. I try to make it back to Pickett once or twice a week to ride with the Pickett crew when I need to get away from the rich and famous lifestyle. Patrick: Whats your favorite trick? Give the viewers a quick trick tip for that trick! Nick: Big Spence would argue that it’s a melon heel 3 haha, but It would have to be an indy poke roll to blind. I find myself doing a couple of them every set because they’re so much fun. The trick to it is really try to spot the water early, while your upside down, and once you see it you can poke it out and the poke brings it around to blind automatically. Patrick: If you could add 3 tricks too your trick arsenal what would they be and why? Nick: 3.Grabbed big perm/big Johnson/toeside frontroll ollie 7 or whatever you want to call it. I think it’ll look different than a whirly trick that way and feels pretty cool. 2.1080 cuz I’ve popped the handle on it so many times it drives me insane. 1.And any toe side backside spin that Danny Harf does. They look like the most fun trick on a wakeboard. Patrick: Whats next for Nick Jonesssss? Nick: I’ve been thinking about producing a new product to sell, its like a Sunggie, but backwards! Patrick: If you could pick any place in the world too ride where would it be and why? Patrick: You can only thank one person for everything… GO! Nick: You! Or wait….my mom…ahh I mean CWB, no actually Adrenaline Watersports and Zinka Sunscreen, iWAKE, Time on The Water and Alpinestars. Patrick: Sneaky, Ill let you have that one. nick would beat around a bush. haha kills it. Sooo hot. Facebook me nick!